DC Direct's first line of figures based on the seminal story Kingdom Come was quite a disappointment: Superman was more pudgy than powerful, Green Lantern was covered in more stickers than paint and even the relatively simple Hawkman had his problems. Perhaps worst of all, Wonder Woman looked like a drag queen. A fat drag queen. An old, fat drag queen. Hardly the "ageless" Amazon referred to in the story. Lucky for us, the poor Series 1 wasn't the last time we'd see her in the line - Series 3 brought us Diana in her golden eagle armor, ready to throw down. Terrorizing the battlefield in her imposing Amazonian armor, Wonder Woman abandons her quest for peace to demand unconditional surrender of the metahumans causing destruction. Lost in her obsession to regain control of the world she vowed to protect, the Amazon Princess warns even her closest allies not to cross her path. Standing 6 3/4" tall, Wonder Woman looks powerful, even when facing down larger figures. She's not the most articulated DC Direct female ever, but she does move at the neck, shoulders, wrists and hips, which is enough to qualify her for "action" figure status. Her hair, spilling wildly over her shoulders, prevents her head from turning very far, though it's no terrific loss. 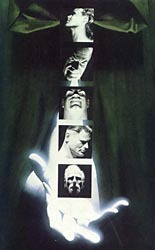 There was a lot of debate in the fan community about the various roles presented in the Kingdom Come advertising: The Eagle. The Bat. The Thunderer. 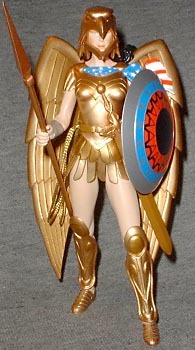 Okay, so the last two were pretty easy, but The Eagle threw everyone - at least until Diana donned her armor. A sleek golden number, the armor is an extension of the double-W bodice she normally wears. She's got sandals, a skirt and big pair of golden wings on her back. It's never really been clear why a mythical princess from an island descended from Greece would so happily wear an American flag, but Diana's still got the stars and stripes in the form of a sash across her shoulders. The helmet is a large, impressive eagle's head. Tim Bruckner did a great job sculpting this second Wonder Woman. She looks much more feminine than the last effort, despite showing a lot less skin. In particular, her face - though partially obscured behind the beak of her helmet - is much better. The only problem is the size of her feet; they're far too small for her body. A person's feet are the same size as their foream from wrist to elbow (go ahead, try it), and Diana's undersized little clompers don't provide a stable platform. Like Hawkman, Wonder Woman's wings can throw her off balance sometimes. While DC Direct included a base with the figure, it's just a reuse of the one that came with Series 2's Kid Flash and is too small to be of any use. She also comes with a 7 1/2" spear and a 2 3/8" shield - though her magic sword hangs from her belt, it is not a removable piece. The spear can be held in her right hand, while the shield can be slipped on to her forearm with a bit of cajoling. Her golden lasso is tied to her right hip. Since, unlike Shazam, Armored Wonder Woman is a representation of a design rather than a specific pose, she could have survived with a bit more articulation. Still, it's not like she's a fully immobile lump, so that has to count for something, right?